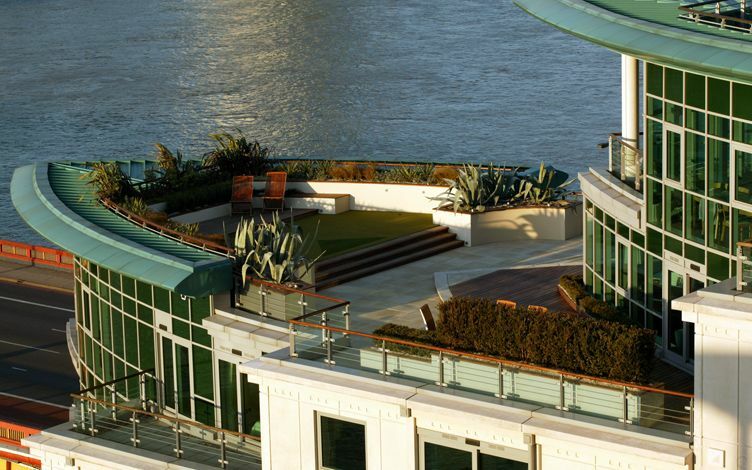 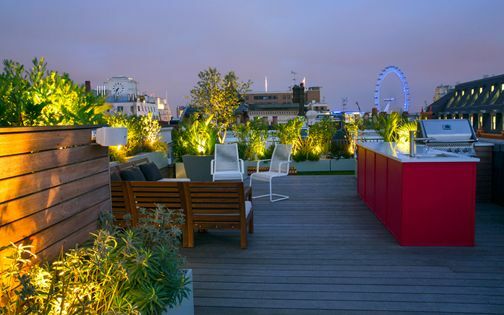 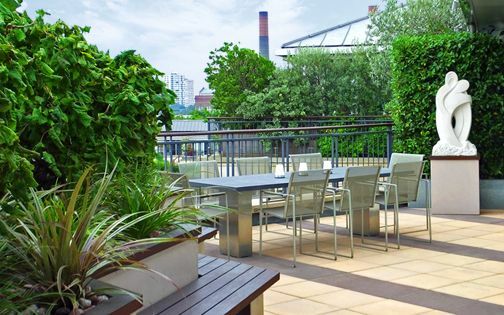 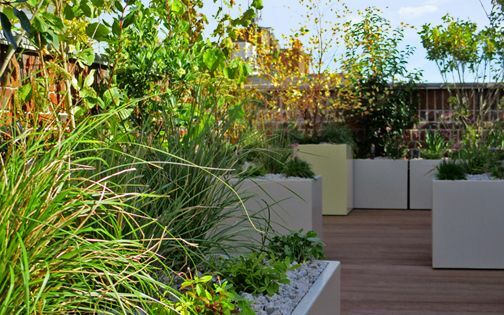 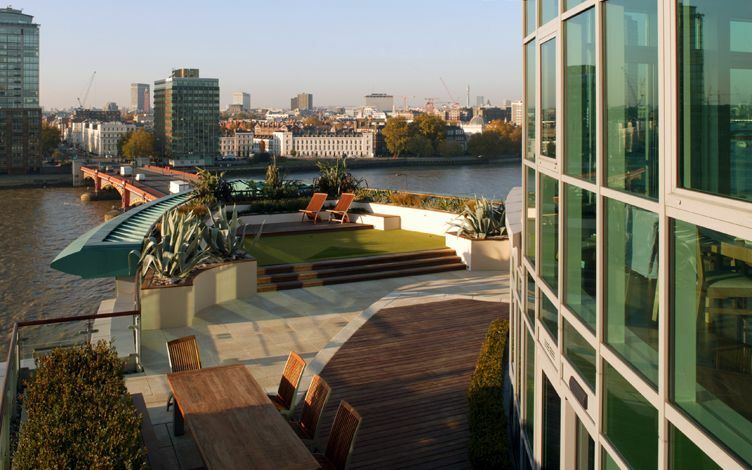 Built at St George Wharf, beside Vauxhall Bridge, this expansive roof garden encapsulates a cinematic aerial platform above River Thames. 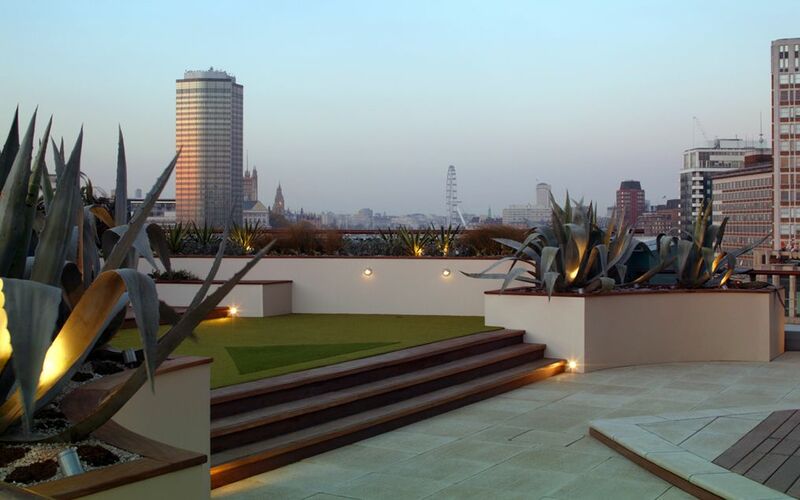 Intuitively organic to its building's sinuous blueprint, juxtaposed by architectural flora, the roof garden's symmetrical design captures an abundance of awe-inspiring London landmarks. 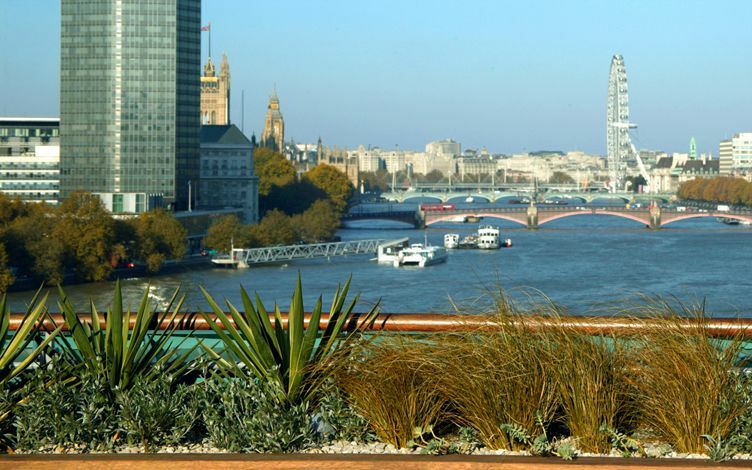 Uncluttered surface patterns merge congruously with surrounding waterfront architecture in outlines, textures and colour palettes, where panoramic views are framed by low ground-cover foliage, generating sculptural silhouettes along a captivating riverside backdrop. 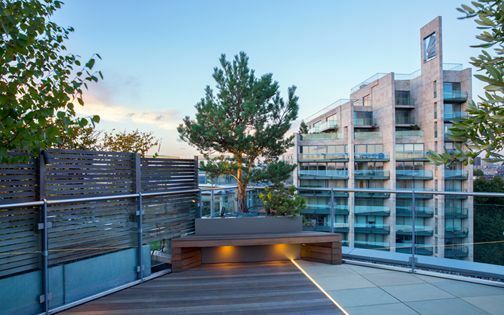 Split-level decks, well-fitted outdoor lighting, a surround sound system and a golf putting green, across four distinct zones, provide optimal entertainment in this remarkable setting for a floating roof garden. 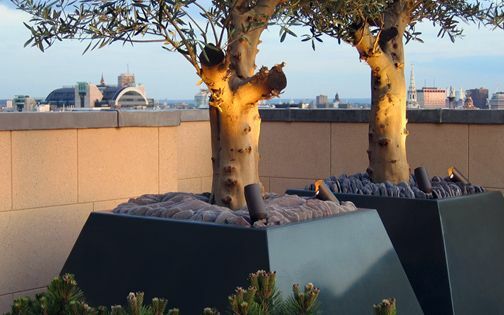 We often devise asymmetrical outlines, and love planting diverse trees in our landscape designs, yet in this unusual site both these inclinations required fine-tuning. 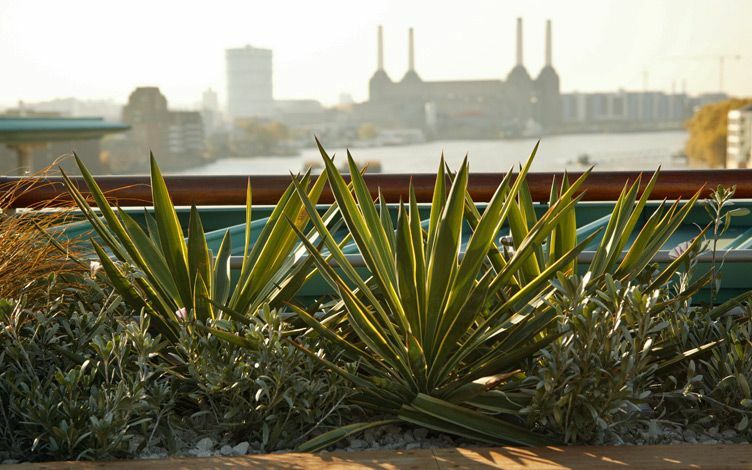 It was vital to utilise a symmetrical design to complement inherent nautical geometry, where low planting would weather constant wind compared to tall flora. 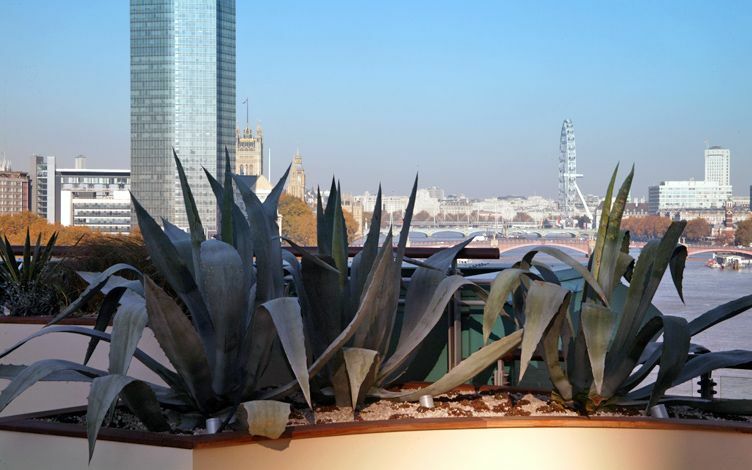 The building's convexly boatlike shape was integrated into its roof garden's layout: two curved raised beds flank the steps, featuring a trio of sculptural Agave succulents, where desert plants thrive amid tricky conditions. 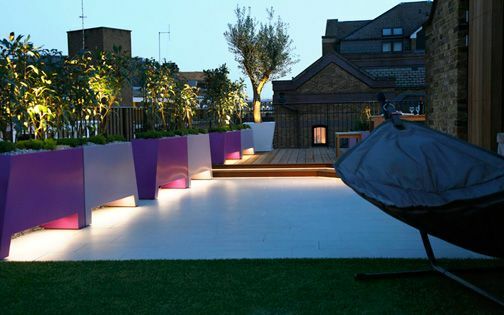 Varied Box hedge designs form architectural definition across decked zones – a low hedge envelops the living room's curvilinear facade, while a taller section secludes a spacious dining area. 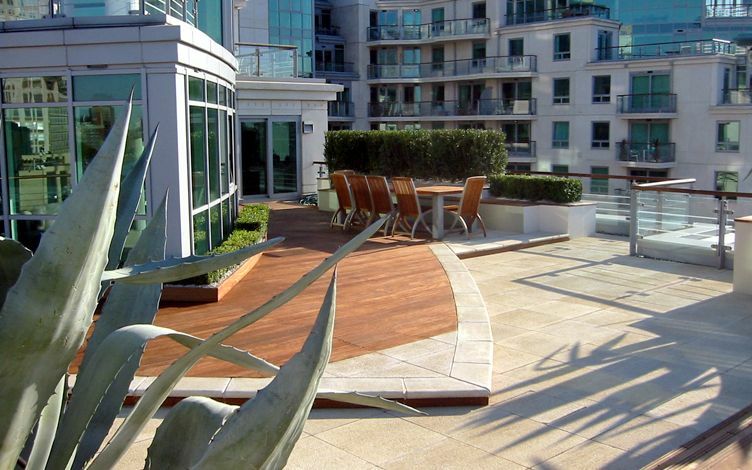 An Iroko deck is edged in beige concrete pavers; its curved outline follows the building's arc. 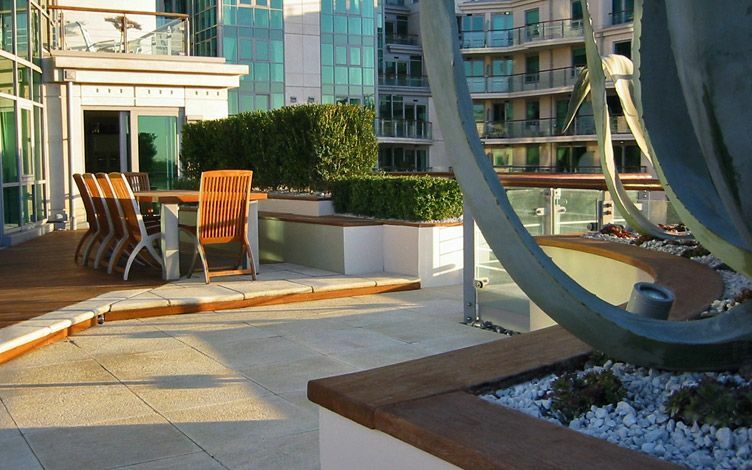 Such large decking, amid a wild westerly wind, required fastening to solid pavers below, while we designed and built a dozen removable covers for existing abseiling access points. 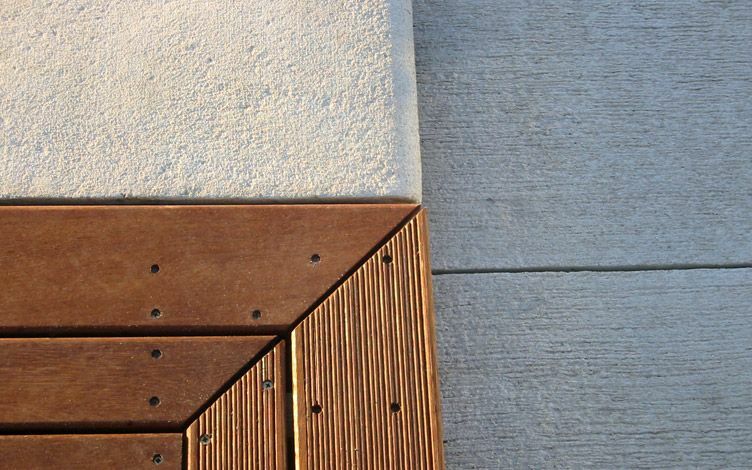 A dynamic pattern of 6“ and 4“ boards produces contemporary nuances, as bespoke Iroko edging and buff concrete pavers trace inherent arcs to form balanced symmetry. 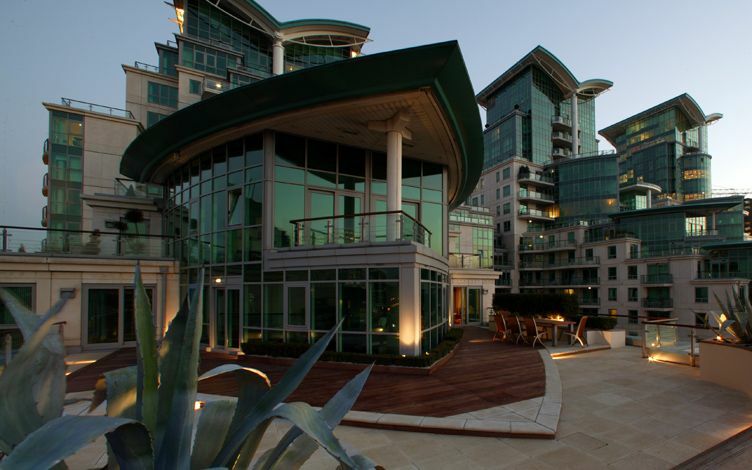 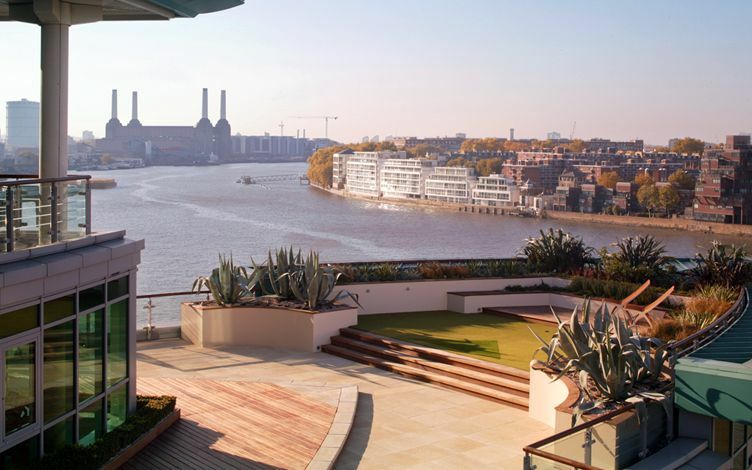 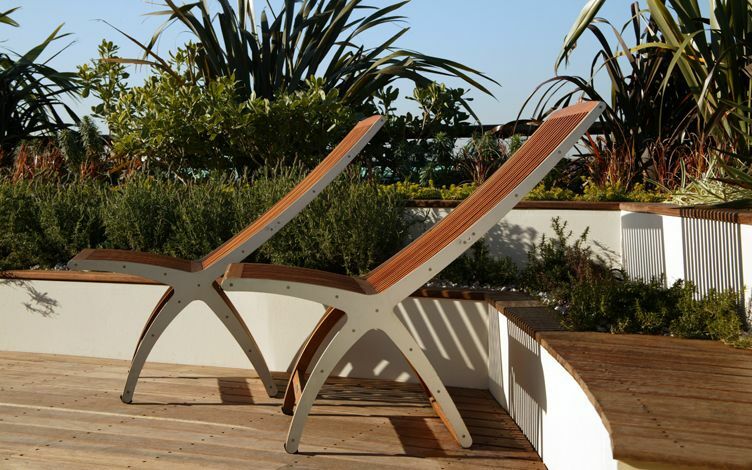 This St George Wharf large rooftop garden interconnects consistently with its apartment's interior framework in definitive fluid geometry, as sheer on deck ambience is enhanced by hardwood curvature within a breezy aspect, immersed in a thriving river waterscape and its distinguishable, iconic terrace landmarks. 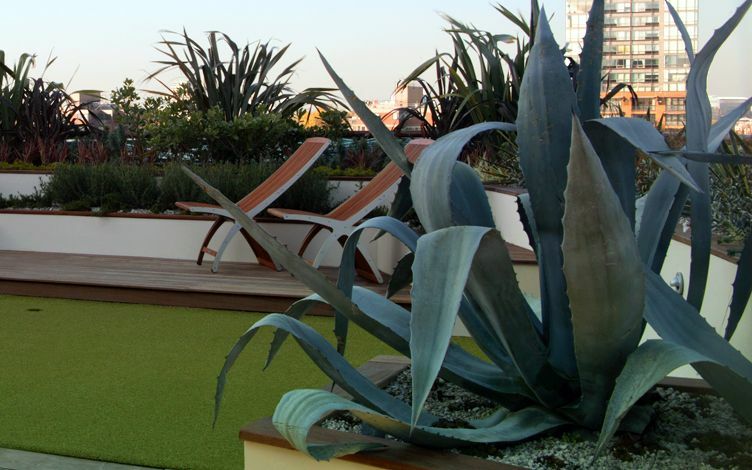 Low-lying foliage forms natural drifts to endure stormy winds, while Box hedging, Agave and Yucca produce anchoring points among the movement of softer grassy textures. 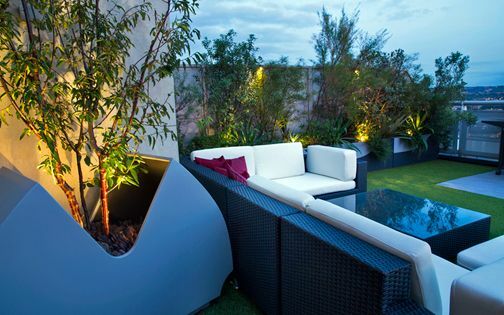 A symmetrical low hedge greens the living room, remaining static while dainty foliage sways in gusty breeze. 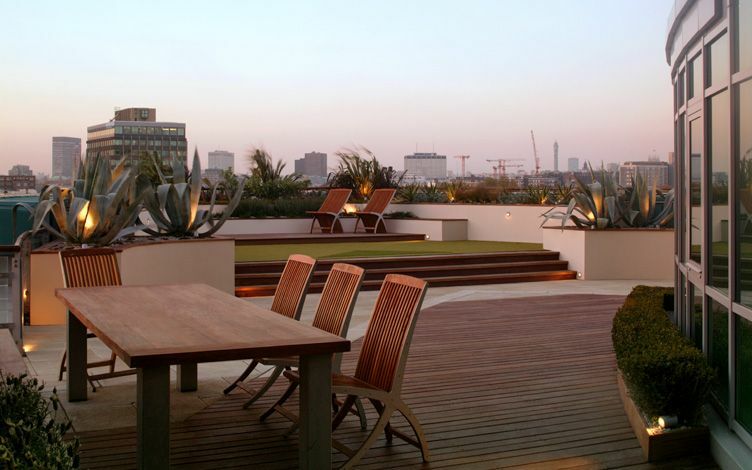 The Box is repeated on a larger scale by the dining area to provide a windbreak and further privacy. 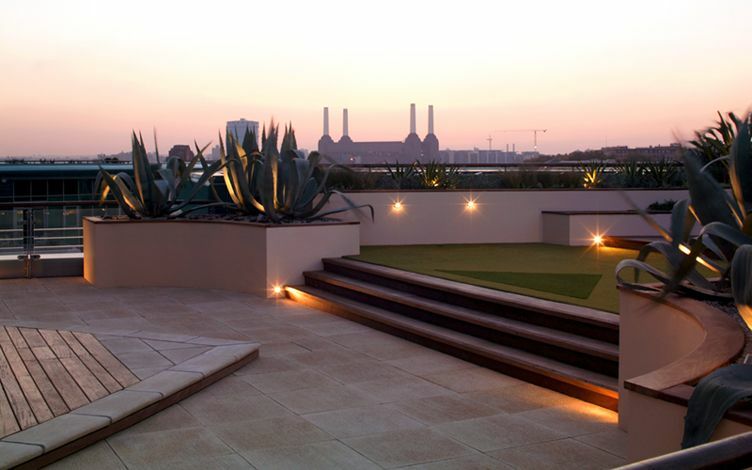 The site formed an immense logistic challenge, entailing a meticulously detailed design process which encompassed creative access solutions, yet, its central river location maintained continual, thorough inspiration, with misty aerial perspectives defining the essence of a unique London roof terrace. 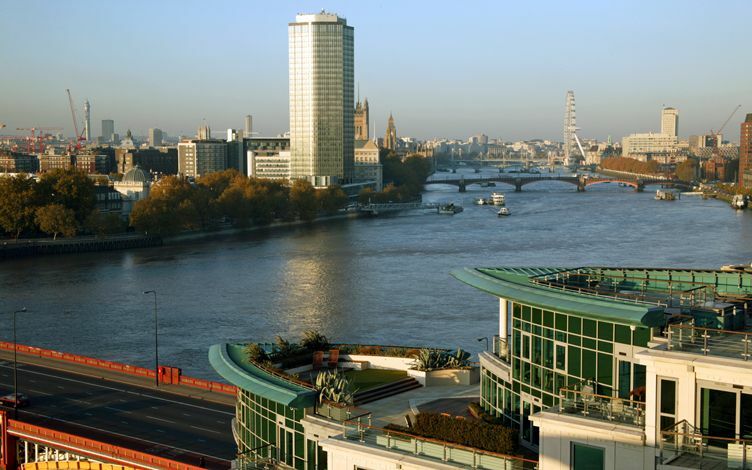 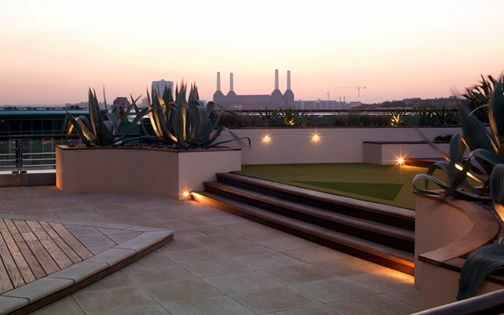 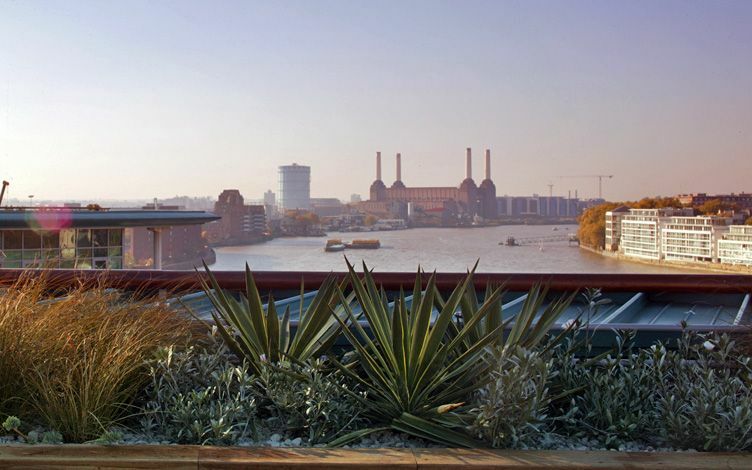 With a captivating continuum of significant landmarks enfolding a contemporary roof terrace design, we naturally retained uninterrupted panoramas, where an exhilarating spectrum of urban vistas includes Battersea Power Station, Big Ben, BT Tower, London Eye, Millbank Tower, SIS Building and Vauxhall Bridge. 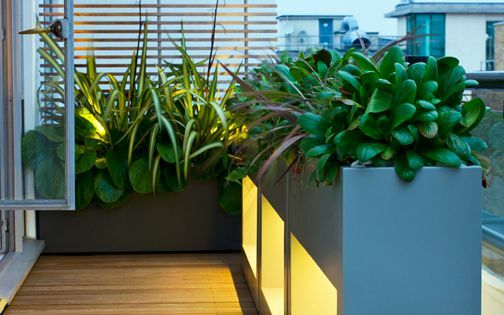 This roof garden's breadth forms an unmistakable silhouette, observed on the bridge approach, delineating a welcoming riverscape feature, as Agave foliage kisses the sky atop Bridge House. 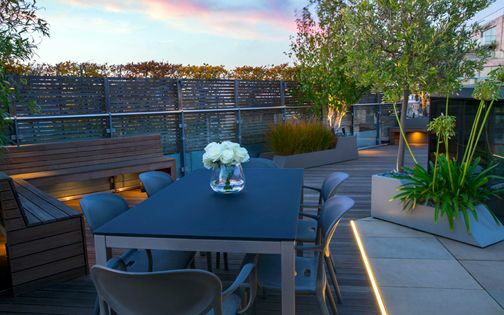 Enjoying this landscape amid such hectic traffic defines a surreal experience at times, yet, on a still day, its cinematic setting generates pure London essence, when a Chelsea terrace sunset narrates an intimate, private roof garden panorama.